The first time I rode on a Segway, I was confused. Even though I loved the experience, I couldn’t quite figure out how it would fit into my life. It wasn’t going to replace my car and it certainly wasn’t a substitute for my bicycle, so what exactly was it? From a public safety standpoint, “banning everything else” was an easy way of managing what has become an increasingly complex marketplace for alternative transportation. At the same time, the easiest approach is rarely the best one. Today, literally thousands of alternative transportation vehicles are coming out of the woodwork and they nearly all have the same problem – no place to drive them. Most are banned from biking and hiking trails, and they are neither licensed, nor licensable, for use on the streets. For these reasons, I’d like to discuss some new possible solutions and why Colorado is poised to take the lead in the alternative transportation marketplace. According to Singletracks, Colorado now has over 5,138 miles of biking trails, far more than any other state in the U.S. This is due, primarily, to money from Great Outdoors Colorado, or GOCO, which receives a portion of state lottery revenues. GOCO has already invested over $34 million in trails throughout the state with more to come. In addition, some local communities have added additional tax dollars to up the ante. Depending on the terrain, trail surface and width, the cost of new trails ranges from $16,000 to $75,000 per mile. With these trails as existing infrastructure, the stage has been set for a new range of opportunities that could open the doors for tomorrow’s alternative transportation industry. The traditional bicycle is viewed quite differently around the world. While some use it strictly as a fitness device, others use it as their primary means of transportation. As an example, during an average week 30% of Germany’s population uses a bicycle for primary transportation. The average German uses a bicycle three days a week for about 30% of their trips. More than 85% of Amsterdam residents ride their bikes at least once a week. According to a regular survey of Copenhagen residents, 84% have bicycles and 68% ride at least once a week. 96% of school children have a bicycle, and 55% use it to ride to school. As the same time, the number of Americans who ride bicycles for sport and entertainment is greater than all those who ski, golf, and play tennis combined. Adding to the list of mobility impaired are people suffering from arthritis (30 million), polio (8 million), traumatic brain injury (5.3 million), stroke (4.7 million), and a wide variety of other suffering from the likes of epilepsy, multiple sclerosis, muscular dystrophy, and many more. Altogether, people with some level of mobility impairment account for 19.7% of the U.S. population. Most of these people have great difficulty with their daily transportation needs, such as driving a car or even riding in one, and a far higher percentage have difficulty riding any form of bicycle. The need for alternative transportation solutions is greater now than ever in the past, and with our rapidly aging population, the demands for new options is growing on a daily basis. Motorcycles (Class 1) — All two or three-wheeled motorized vehicles with saddle seats and are steered by handlebars rather than steering wheels. This includes motorcycles, motor scooters, mopeds, motor-powered bicycles, and three-wheel motorcycles. Passenger Cars (Class 2) — All sedans, coupes, and station wagons manufactured primarily for the purpose of carrying passengers and including those passenger cars pulling recreational or other light trailers. Other Two-Axle, Four-Tire Single Unit Vehicles (Class 3) — All other two-axle, four-tire, vehicles including pickups, vans, campers, motor homes, ambulances, and minibuses. Buses (Class 4) — All passenger-carrying buses including school buses. In addition to these four classifications are nine more for trucks and the trucking industry. However, there are no classifications for alternative transportation vehicles such as Segways, hybrid bicycles, pedicabs, electric skateboards, powered unicycles, etc. Can bikers and joggers coexist with alternative transportation vehicles? With countless decades of bicycling culture already in place, these alternative transportations vehicle may seem disruptive to the existing ecosystem. However, defining a new classification of vehicle with minimal intrusiveness, the stage can be quickly set for far less disruptive modes of transportation than today’s cars, vans, buses, and trucks. Please note that this criteria is just intended as a starting point. Many adjustments and details may be added over time. Shown at the end of this article are a number of possible vehicles that either currently fit or could be revised to fit in this class of vehicle. The State of Colorado has an unprecedented opportunity waiting to be unleashed. With an existing infrastructure of over 5,000 miles of biking trails and an existing revenue stream to add more miles in the future, much of what’s needed is already in place. By defining one or more new classes of vehicles that could co-exist well with existing biking and hiking activities, the State could take the lead in reducing today’s focus on heavy vehicles (cars, vans, buses, and trucks) on the highway. At the same time, these vehicles could open the doors for the countless million of mobility impaired individual left stranded by today’s limited options. Keep in mind that some trails in places like Boulder and Ft Collins are already quite crowded, so adding congestion to them is not reasonable. But most existing biking trails have very light traffic, so additional vehicles would have little impact. Individual cities could declare themselves as official “Alternative Transportation Friendly Communities” and leverage this in their economic development material to attract key players from the mushrooming pool of vehicle manufacturers looking for a receptive audience. As an avid biker, I spend countless hours every year enjoying the seemingly endless trails that Colorado has to offer. I love the outdoors and use bicycling primarily for fitness and entertainment. Only rarely do I see congestion or crowded conditions on these trails. But in my car, I’m dealing with traffic snarls on a daily basis. Driverless cars offer hope for crowded highways in the future, but widespread use of driverless vehicles is still 20-30 years away. Alternative transportation vehicles are part of an existing and rapidly growing industry, and this industry is anxiously waiting for a community to champion their cause. It certainly may not be Colorado, but the opportunity is poised and waiting to happen. So is it possible to reduce today’s emphasis on our heavy transportation highway system with a new alternative transportation network? I’d love to hear your thoughts. Bimal Rajappan is a Mobility and Vehicle Design student from India. 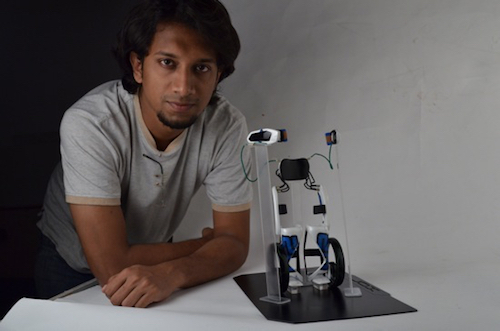 He displayed his Segway inspired wearable mobility design at the Design Degree Show 2012, an annual design festival organized by IIT Bombay’s Industrial Design Center. The design involves two hubless wheels, which the user straps to his legs and is powered with electric motors. The controller unit, which is also used to stabilize the wearer, is strapped on like an exoskeleton. The concept includes suspensions through a pneumatic system comprising of dampers. Bimal call them air muscles. A battery and the processing unit are attached to the back of the frame inside an LED illuminated unit.